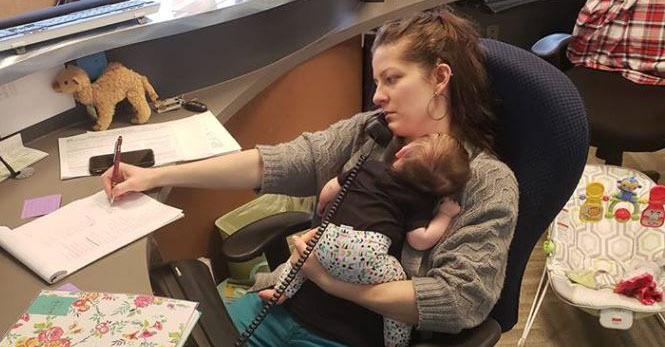 When Melody Blackwell’s boss snapped this photo of her cradling new daughter Nora-Jo while getting on with her day at work, they had no idea of its appeal. Within days the post had gone viral with hundreds of people posting comments and sharing on their personal pages. Melody who’d recently returned from a three-month maternity leave was bringing baby, Nora-Jo, into the clinic once a week, while working from home the other four days. It’s a mutually beneficial arrangement and one that Melody’s boss Dr Elizabeth Baker, owner of the Tennessee Chiropractic clinic where the women work, is passionate about encouraging other employers to do. Parental leave: What are your rights? Here in Australia, the idea of a woman having to return to work with such a tiny baby would be the exception to the rule. Thanks to mandated maternity leave, most of us are entitled to paid time off while looking after our babies and recovering from birth. But there’s no such thing in the US, where women have no legal ‘right’ to time off to care or even recover from birth. It’s a situation that forces many women to leave tiny babies like Nora-Jo in daycare – or leave the workforce altogether. When Melody got pregnant, she and Elizabeth sat down to work out a return-to-work plan. Both women admit their situation might not fit all workplaces, but feel other companies should at least be open to having a conversation about it. Melody says patients visiting the chiropractic clinic have been welcoming and are always interested sneaking a peek at tiny Nora-Jo. “But so far no one has asked to hold her, probably because she’s so young,” says Melody. While she grows, lets hope Nora-Jo’s time in her mum’s workplace will sow some many-needed seeds in bigger companies in America to follow suit.